Hyaluronic Marine Moisture Cushion Review (2018): Is It Worth Buying? Dr. Dennis Gross Skincare Hyaluronic Marine Oil-Free Moisture Cushion Review: Is This moisturizer Safe To Use? Dr. Dennis Gross Skincare Hyaluronic Marine Oil-Free Moisture Cushion, US $58 for a 1.7 oz jar, is an intensive moisturizer that relieves skin dryness while also causing your skin to plump and appear fuller. About Dr. Dennis Gross Skincare Hyaluronic Marine Oil-Free Moisture Cushion — Does It Really Work? This product is brought to you by Dr. Dennis Gross, the skin care brand formulated by the trusted skin care professional now recognized to be made only of high quality, well-thought out ingredients that promote healthier, more beautiful skin. Dr. Gross led a successful career in skin cancer research where he was convinced how most products available in the market do not really meet the requirements of good skin care. He started formulating his own product for personal use then, these were given out to family and friends, eventually growing the brand to what it is today. Relieve skin inflammation and support healing. Soften and smoothen fine lines and wrinkles. What Are The Ingredients In Dr. Dennis Gross Skincare Hyaluronic Marine Oil-Free Moisture Cushion? Marine Algae: Loaded with B Vitamins, it helps restore the nutrients lost to your skin while simultaneously enhancing your skin’s moisture content. Hyaluronic Acid: Attracts water from the surroundings which significantly improves your skin’s hydration and promotes well moisturized skin that lasts for hours. Glycolic Acid: An alpha hydroxy acid that gently lifts and eliminates your skin’s damaged top layer which, in turn, stimulates faster skin cell regeneration and renewal. Coconut Extract: Deeply conditions and moisturizes, this ingredient also supports skin healing as it relieves inflamed skin. Hyaluronic Marine Moisture Cushion doubles as a daytime and nighttime moisturizer. Apply on freshly cleansed skin every time. Hyaluronic Marine Moisture Cushion does not contain parabens and phthalates. This product has been subjected to a consumer perception survey where 79 per cent of respondents said that their skin felt softer and smoother. This product is formulated to deliver instant but not lasting results. Dr. Dennis Gross Skincare Hyaluronic Marine Oil-Free Moisture Cushion reviews indicate that different people experienced this product in different ways, that includes possibility for irritation and breakouts. 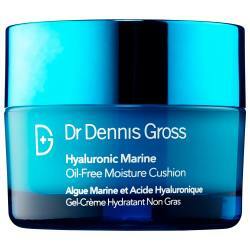 Does Dr. Dennis Gross Skincare Hyaluronic Marine Oil-Free Moisture Cushion Have Any Side Effects? Skin irritation and allergic reactions due to several ingredients, including butylene glycol and synthetic fragrance ingredients. Increased risk for reproductive health related damages and dysfunctions due to EDTA. Increased risk for nerve damage and brain dysfunction due to phenoxyethanol, a neurotoxic preservative added to this product as preservative. Dr. Dennis Gross Skincare Hyaluronic Marine Oil-Free Moisture Cushion will deliver for you instant gratification for the deeply moisturizing feeling the formula brings. However, when you want lasting results over the longer term, this will not be the appropriate product for that purpose. Nevertheless, you will get the softer, smoother skin you desire.